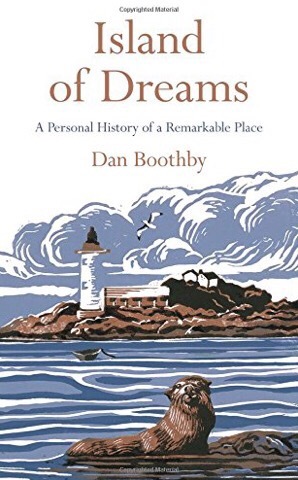 Island of Dreams is an account of Dan Boothby’s time as an unpaid volunteer warden on Kyleakin Lighthouse Island, a former home of the famous writer Gavin Maxwell, author of Ring of Bright Water and other books. The lighthouse is no longer a lighthouse, and the island is barely an island – it serves as a foot of the Skye Bridge between Kyleakin and Kyle of Lochalsh. Boothby has been fascinated by the life and works of Gavin Maxwell since he was young, so when he was given the chance to live on the island, he couldn’t resist the opportunity to walk in the man’s footsteps, but at times reading this book you get the feeling that the footsteps are faint and the trail is cold. There is a tremendous sense of melancholy throughout the book, aided in part by the depiction of the almost constant Inner Hebridean rain, but mostly coming from Boothby’s attempts to connect with the past while living in a run-down, derelict present. The spectre of death hangs over the book, to the extent that the depiction of a funeral about half-way through fits in with the tone of the book as a whole. He weaves accounts of Maxwell’s life through the book, tying in his growing understanding of this complicated and infuriating man as he spends more and more time on the island. These accounts are fascinating, but if you want a complete biography of Maxwell, look elsewhere. But I have to admit, I’ve never been particularly interested in Maxwell anyway. Probably unlike most people, that’s not why I picked up this book. I grew up on Skye, just a few miles from where Boothby worked. I’ve never seen the Skye Bridge – when I lived there in the 80s, you still had to get the ferry from Kyle of Lochalsh to Kyleakin. The memory of the rain sticks with me, even after all these years – I went to my first day at Portree High School wearing one of my Dad’s bright yellow oilskin jackets. I remember climbing the hills behind the town in borrowed hiking boots and returning them with pints of rainwater in them. So all of Boothby’s descriptions of the weather and the scenery brought back memories. His encounter with a vole that bit the pad of his finger made me laugh out loud – the exact same thing happened to me, and yes, I had to shake the little bugger to get it off me! I bore the tiny vole tooth scar for years. When Boothby runs down his categories of members of a Highland community, from Natives through Locals, Incomers, Tourists to Second Home Owners (the lowest of the low) I pondered what category I belonged to when I lived there. Not a Native, for sure, but probably somewhere in between Local and Incomer. By the time I left Skye, I’d lived there for about a third of my life, and leaving it was an enormous wrench. I’ve lived in Leicester for over two decades now, nearly half my life, but I felt more at home on Skye than I do in the East Midlands. There are places on this planet that touch you deeply, and Skye is one of those. When Boothby writes about his leaving the island, I felt his pain in a physical way. Nostalgic for me, too, was his writing about the lighthouse and the keepers who lived on the little island, back when it was still an island. My Dad was a lightkeeper on Skye – not on Kyleakin Island, which was automated in the 60s, long before we lived there, but at Neist Point, on the high-cliffed west coast of the island. My Dad was one of the last lightkeepers, spending the last few years of his service travelling from lighthouse to lighthouse, wherever he was needed, running ahead of the relentless pace of automation. Reading about Boothby’s life, I wondered if he was born just too late; a few decades earlier, in my Dad’s generation rather than mine, and he might have found great pleasure in becoming a lightkeeper – his passion for solitude, the sea, the weather, and the flora and fauna of Scotland would have been nourished by the life of a keeper, and would certainly have inspired his writing. A short note about the cover, by Sarah Drummond – I’m a sucker for pictures of lighthouses, of course, but this is particularly beautiful, with strong, simple colours making a striking image of the island with an impertinent-looking otter in the foreground. It’s a book that I’d recommend without hesitation to anyone interested in Gavin Maxwell; more broadly to anyone interested in Highland life; but most of all to anyone who enjoys simple, beautiful writing.